This little gem has made the inside pages around the word this week as a Chinese zoo’s supposed “African lion” was exposed as a fraud. The dog that the zoo had used as a substitute started barking… raising eyebrows and suspicions that it might not actually be a lion. It quoted a customer named Liu who wanted to show her son the different sounds animals made – but he pointed out that the animal in the cage labelled “African lion” was barking. 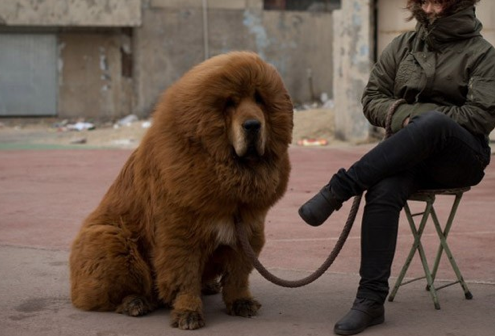 The beast was in fact a Tibetan mastiff – a large and long-haired breed of dog. In a rad faced interview the the chief of the park’s animal department, Liu Suya, told the paper that while it does have a lion, it had been taken to a breeding facility and the dog — which belonged to an employee — had been temporarily housed in the zoo over safety concerns. I think he might be lying, especially as the zoo was also found to have two coypu rodents in a snake’s cage, a white fox in a leopard’s den, and another dog in a wolf pen. Barking mad if you ask me.